This bike carrierrack features strong steel tubing along with black powder coating for durableoutdoor use. Swing down feature allows access to rear of a car, van, or truck.Two plastic tightening knobs are aligned along with punched holes to lock bikesinto a safe and snug hold. 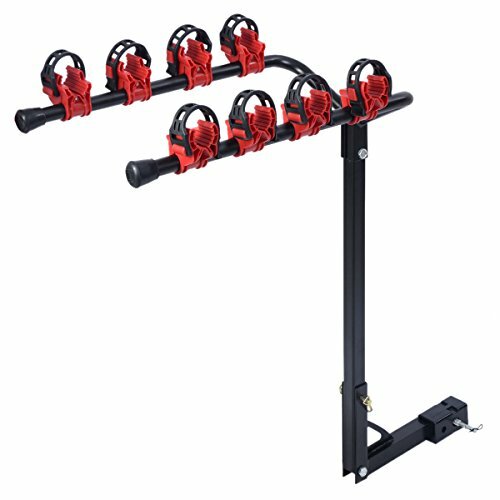 Rack mounts on most vehicles with both 1-1/4"and 2" common receiver. Note: Simple assembly is required according to theincluded instruction. Sturdy Construction: Heavy duty steel tube construction without the risk of rust allows long-lasting use to bring a durable utility satisfaction for you. Strong body guarantees repeated use when in loading. The Hitch Extender fits into 2" square hitch receivers, also can be used on 1-1/4" receivers with a hitch adaptor. Premium Performance: Good helper for your long-distance loading. Its premium quality ensures multiple kinds of bikes being transported right to the destination without any accidents appearing. Oversized bikes can also get a great position on this Extender. Large Load Capacity: Large load distributed capacity becomes an incredible help on loading bicycles. It can shoulder 4 bikes in maximum in order to fulfill your purposes for many different situations. It is widely adopted for use in carrier, car, truck, Auto or SUV. Safe Guarantee: The rubber holders can help to hold bicycles which can perfectly avoid preventable accidents , such as falling down, skidding away and so on. The dual lock design also ensures stability to keep your bikes in a safe and sound condition. Added Values: Simple design with stainless appearance, function-oriented extender strives for more loading space for users; easy to storage and its compact feature can be taken hither and thither.